Cover all your bases with MLB® shoes from Keds. Our Pennant collection baseball style sneakers and other exclusive sneakers are a win-win, whether you’re cheering from home or away. 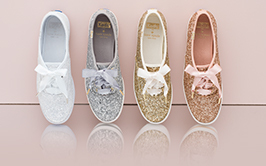 The MLB® Pennant collection by Keds lets you cheer on your home team in cool, comfortable style, whether you're in the bleachers, at a bar or on your way to a World Series watch party. Cute, red baseball lace details and embroidered logos on vintage baseball style shoes will let everyone know whose side you're on. Once you find your MLB® shoes, coordinate with Keds socks and baseball caps in your team colors from our collection of women's accessories.